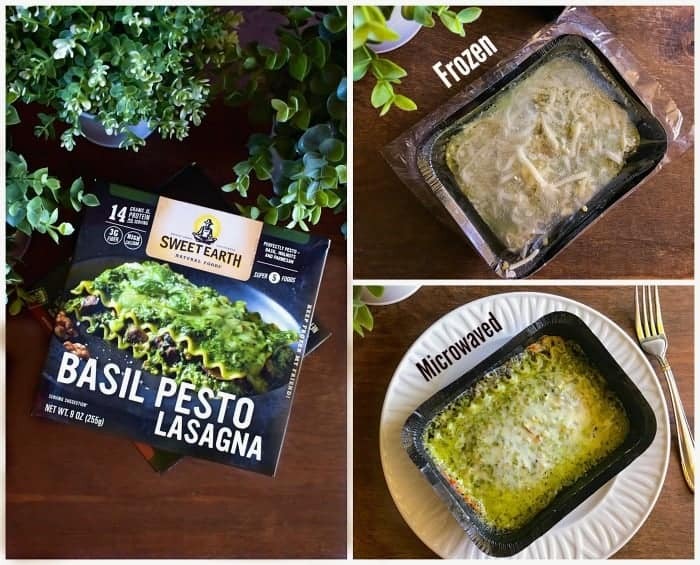 – Thank You, Sweet Earth, for Sponsoring this post and all opinions expressed here are mine –Sweet Earth Review-Basil Pesto Lasagna: a review on some of the sweet earth – enlightened foods products that I’ve tried especially the ‘Basil Pesto Lasagna’. Today’s post is all about Sweet Earth Review, especially their Basil Pesto Lasagna. I’m a huge fan of ‘Sweet Earth – Enlightened Foods‘ products and always have them stocked at home. 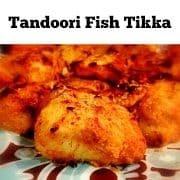 As you all know, I cook on a daily basis and try to incorporate fresh food as much as I can, however, there are days, when I just don’t have the time or the energy to even make a salad and that’s when I heavily rely on ready-to-eat meals. 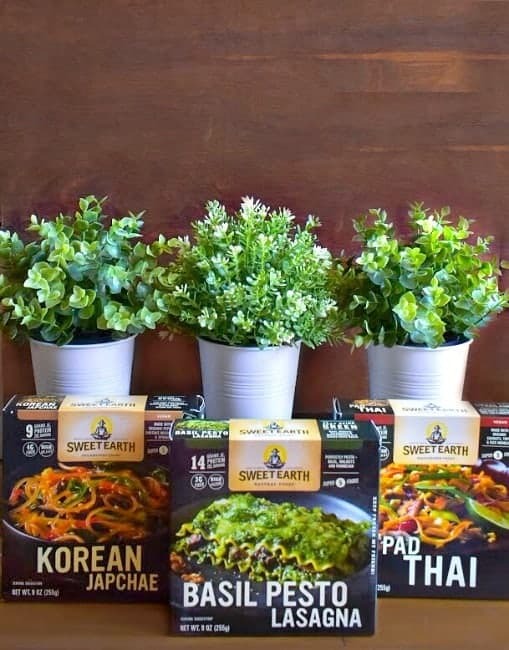 When I say ready-to-eat meals/frozen food, I’m not talking about your typical store-bought freezer section food but ‘more gourmet meets flavors meets nutrition’ kind of products and that’s how I discovered Sweet Earth. 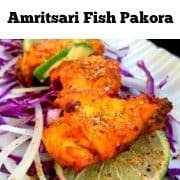 I first tried them a year back and was literally blown away with the kind of variety they have in the frozen meal section (which We’ll talk about below) but also by the fact that their food is nutritive and delicious! So, when I got a chance to review them here, I was more than happy and wanted to definitely share it with you’ll. 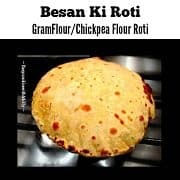 I can literally name so many occasions when we were so hungry and not in the mood to cook OR when we were running late and needed a quick bite OR just wanting to try a fun yet easy recipe – Sweet Earth has always surprised us with its option and flavors. They not only have local US flavors but also a whole lot of global options to choose from (India, China, Italy, Japan, France n much more). 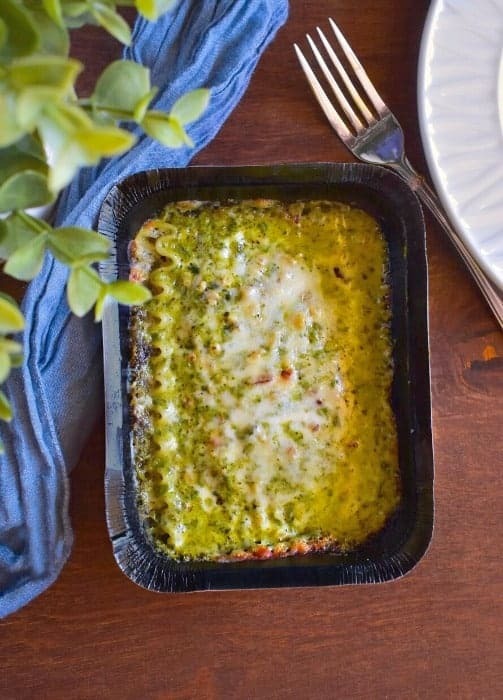 I had so much option to choose from but then something new caught my eyes – The Basil Pesto Lasagna – What !!!!! I mean, seriously, we have tried a lot of frozen food but never a lasagna and that intrigued us so much, that I decided to review it here. 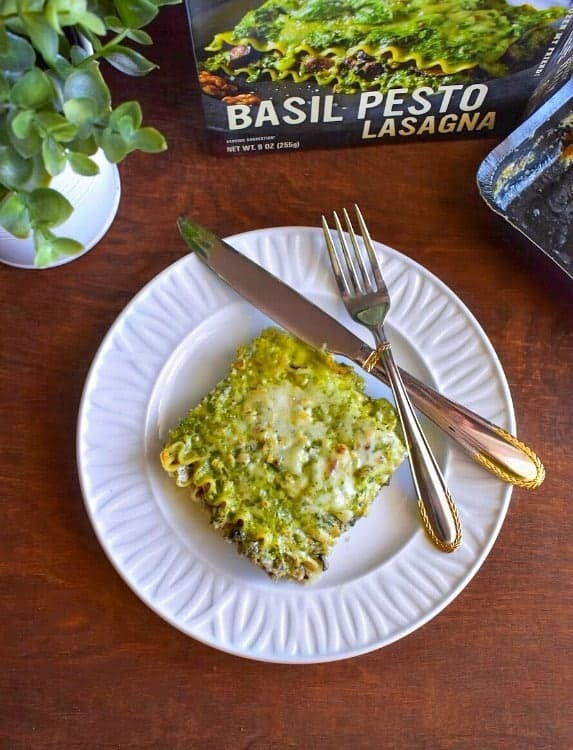 The ‘Basil Pesto Lasagna’ belongs to their ‘Artisan Bowl’ category, comes in a 9.oz net weight and easy to microwave bowl. 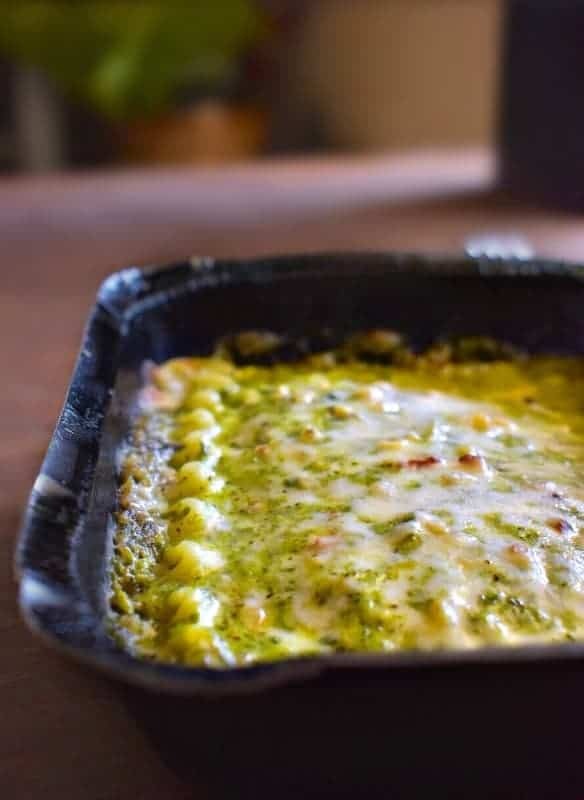 The lasagna or ‘pesto-alla-Genovese‘ as it’s called in Italy, is basically layers of semolina pasta filled with walnuts, pesto, mushrooms and 3 kinds of cheeses (mozzarella, parmesan, and romano). I microwaved it for 3.5 minutes (as per package instructions) and in those 3.5 minutes, it turned into this creamy, rich and almost fresh out of oven kinda looking lasagna that’s filled with 14.g of proteins!!! Now, that is what I’m looking for when I want to eat a frozen meal – Taste with Health! Once, out of the microwave, you could see the cheese bubbling and some of the brown crust on the corners (which I absolutely adore). 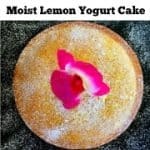 I did wait almost a 30 seconds to dig in and it tasted absolutely delicious and comforting in every bite. 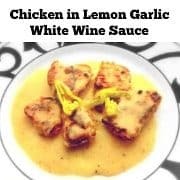 Especially with the season of fall almost here, we are definitely moving towards more of comfort food, so this was one such a treat with minimal efforts. Below, you could see the layers and the filling more prominently as I served these to our cousins who were visiting us from abroad. This weekend was any which way so tiring for all of us as we were all over the Bay Area, showing them around and coming home to a meal that was done on 9 minutes for 4 of us, was more than divine for us. 1. Artisan Bowls: colorful blends of vegetable + protein from all over the world. 2. Exotic Burritos: influences from around the globe. 3. Breakfast Burrito: quick grab and go kind of meal. 5. Veggie Burgers: delightful veggie burger patties. 6. Savory Grounds: pre-seasoned and pre-cooked options. 7. Breakfast Meats: healthy and vegetarian twist to all your meaty breakfast delights. 8. Seitan: tender and juicy food derived from wheat and cooked in vegetable broth. Comes in slices, strips or even grounds. I’ll go ahead and try another one of their products and will let you know about them soon here or over my social media channels. No Replies to "Sweet Earth Review-Basil Pesto Lasagna"